Hard as it is to believe, the iPhone is a decade old. It seems as though everyone has been talking on one, walking head down staring at one, or taking photos with one forever. According to Brian Merchant, as of 2016, one billion iPhones have been sold. The world has gotten so used to this ubiquitous pocket-sized mobile computer that it has become “the best selling product of all time,” even “the pinnacle product of all capitalism to this point,” in Merchant’s estimation. 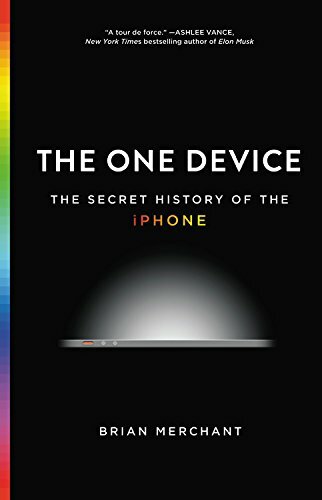 Moreover, in order to research this book about the device, Merchant traveled to every continent except Antarctica, deliberately smashed one iPhone, dismantled another, and had a Chinese tinkerer build one from scratch with used parts. Give the guy a ton of credit for going the extra mile to tell the story of how Apple assembled the tin, silicon, glass, and other elements for the hardware, while it harnessed the human ingenuity for the software to invent the iPhone. He is also very good in describing how Apple used secrecy and artificial scarcity of the product so cleverly that it is not just efficient and profitable but addictive. The question is: did all of his obsessive research make it a better book? Not necessarily. Merchant gets a metallurgist to pulverize an iPhone in order to identify its elements. Then he treks into the hellish mine in Bolivia where laborers suffer at an altitude of 15,000 feet to extract tin for the device. In the Atacama Desert of Chile he shows how lithium is extracted for the batteries. Most of these techie expeditions don’t really move the story forward; they get in its way. However, his visit to the industrial city of Shenzhen in China, where Apple contractor Foxconn employs thousands to assemble phones, is an investigative coup. This is not “iPhone City” but a different colossus that might be called “Smartphone City,” since other electronic manufacturing plants are here, too. Merchant penetrates the security of the place by telling a guard he has to go to the bathroom. He then leaves undetected and roams about. Several overburdened and underpaid workers answer enough of his questions that he can write authoritatively about Apple’s ugly Chinese manufacturing side. There were so many suicides some years back that nets have been installed around the Foxconn dorms so workers can’t jump to their deaths. One worker told Merchant her job was to polish the screens on 1,700 iPhones a day for 12 hours. Others told him failing to meet a quota or committing a mistake resulted in humiliating public censure. Another key Merchant contribution identifies the Apple team members who spent years figuring out how to make things we take for granted happen. People such as user-interface designers Bas Ording and Imran Chaudhri, building on prior work of pioneers, conceived the look and feel of the device—especially the ability to scroll, pinch, swipe, and zoom on a touchscreen. All this contributes to Merchant’s main point: Contrary to the widespread belief, Steve Jobs did not invent the iPhone. Originally he just wanted a better phone than the one in his pocket. Jobs made some smart choices, like eliminating the click-wheel already on the iPod. He launched the iPhone brilliantly. Yet at first he opposed third-party apps, which unlocked the device’s potential and turned the iPhone into a money machine. The One Device illustrates that the iPhone is an example of “convergence technology,” an invention not of one man or one company but of many. What the book, alas, does not investigate in any meaningful way is how and why it has profoundly changed our work, home, and personal lives in just 10 years.